While this may look like one great big bush, it is actually several. A young Grappenhall Lavender is front and center and a darker flowered young Grosso Lavender is directly to the rear which is adjacent to a White Grosso Lavender. Far off to the right is a Yellow Lavender. And, just peaking around the front left corner is the smaller pale pink Jean Davis Lavender which is the only Lavandula angustifolia in the picture. Grappenhall Lavender is one of the largest of all the Lavandula x intermedias, sometimes referred to as Lavandins. Like most perennials, it should be planted in early spring in zones 5 though 7 and may be planted either in spring or early fall in zones 8 and up. Using one of our three-inch Grappenhall Lavender pots your new baby lavender should reach about a foot tall the first year (assuming adequate growing conditons). The second year it should reach the two and a-half to three foot mark and should be maintained to stay at this height. This means it will need to be pruned to about two feet. This will allow for growth to reach the two and a-half to three foot mark the following season. This measurement does not include the height of the blooms which add another two feet or more. The vibrant purple Grappenhall Lavender plants on the left are in full bloom. They will bloom for about four weeks before they start to look spent. In that time, the bees will have a field day and the air will be sweetly scented when the plant is disturbed by man or nature. 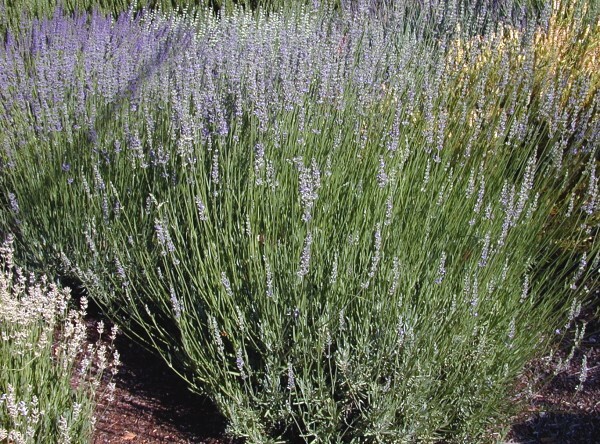 Grappenhall Lavender has long flower stems and makes a good cut flower for bouquets or other crafts. For drying, cut when the first buds open at the top of the flower wand. Both the leaves and the flowers make good additions to potpourri and can be used in cooking. 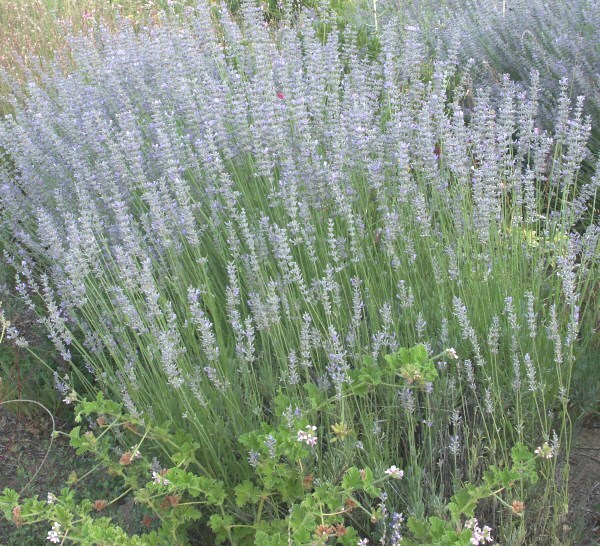 Try blending Grappenhall Lavender with other culinary lavenders, like Jean Davis Lavender, for use in tea. 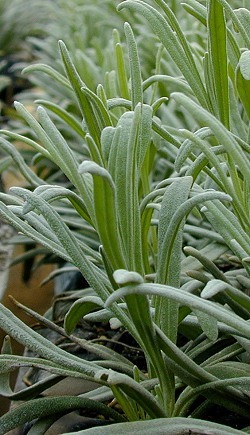 Looking at the size of a lavender's leaves is a good way to judge the size it will become. The larger the leaf the bigger the bush will ultimately be and the faster it will grow. Grappenhall Lavender is an excellent choice when a 2 to 3 foot hedge is desired. This plant is often available in plug trays. These trays hold 128 of all the same plant. They are a great low cost way to fill a lot of space. Each cell is 3/4 of inch by an inch. Check here to see if Grappenhall Lavender Plug Trays are available. Grappenhall Lavender is one of the six plants chosen to be in our Zone 5-11 Tea Herb Garden and our Wildlife Herb Garden Six Pack.